The front of Omnivore Books. Omnivore Books, located on Cesar Chavez just around the corner from Noe Street, is an oasis for cooks and cookbook collectors. The attractive hanging signboard acts as a beacon to the curious passerby unless of course it is already on one's stop and shop destination list. Once a well-known neighborhood butcher shop, now a refined culinary book store, Omnivore Books opens up a world of possibilities to the novice as well as the skilled chef. The store stocks an array of collectible books from the 1930's edition of "Food in Fashion in Beverly Hills," to the recently released "Born Round" by former New York Times restaurant critic Frank Bruni, not to mention standbys like "The Joy of Cooking" and "Bon Appetit." Since the release of the popular movie "Julie & Julia," the honorable Chef Julia Child’s cookbooks are again in the limelight. A selection of her books are posed on the entry table. 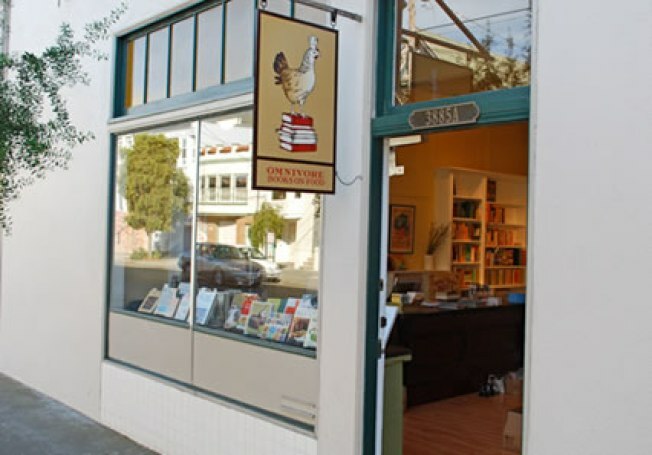 The signed copies of books by local authors, include the guidebook, "Cracks in the Asphalt" by Alex Hatch, "The Zuni Cafe Cookbook" by Judy Rodgers and "In Defense of Food: An Eater’s Manifesto" by Michael Pollan are stacked next to rare first editions and cartons of fresh eggs from free range chickens in Tomales Bay. The events roster for guest authors is a dream come true for cookbook aficionados. Well organized weekly get-togethers are informal, informative and entertaining. Whether you're contemplating a feast or simple Sunday supper, a visit to Omnivore Books won’t disappoint.